Military compass provides a precise direction for you. Measure direction, Side Inclination,Side Dip Angle,Orientation,Slope Angle and Vertical Circle. The map compass comes with a mini carrying bag that you can used to store the compass and tie to your belt. A good partner in the outdoors activities.you can carry the portable outdoor compass everywhere，such as:camping,hiking,adventure and so on. The orienteering compasses also can be used for a gift to your friends who are easy to get lost in an unfamiliar environment. 【MULTIFUNCTIONAL COMPASS FOR BOATING,MAPPING AND GEOLOGICAL】The Orienteering compass is not only can show you the way,but also can measure azimuth,calibrate map azimuth,measure magnetic azimuth,measuring distance,inclinometer,speed calculation,slope gradient.It is very perfect for adventurer,geologist,traveller and so on. 【SIGHTING MIRROR MAKES HIGH OPERATION EFFICIENCY】The geological compass is mainly composed of two parts:compass and odometer.The compass part has a lifting ring ,a disc seat,a magnetic needle and a goniometer.More importantly,sighting mirror is designed with the lubber line and sighting hole,which will improve the accuracy of sighting.Our directional compass is very suitable for geologists,surveyors. 【GIVE YOU A RIGHT DIRECTION】The multifunctional compass will lead you to the right direction,and you are not worry that you would get lost at outdoor activities any more.What is more,you are no longer afraid of weak GPS and unable to show the direction by telephone. The compasses even can replace the GPS of your phone to show you the way. In a word,a compass is necessary for everyone. 【STABLE PERFORMACE & RELIABLE ACCURACY】The military compass have a magnetic declination regulator that can manually correct the magnetic declination of all parts, so that the accuracy is higher.With magnetic needle brake,positioning will be more accurate. Moreover,it combines with the sighting line and reflector mirror,which make the compass more reliable.In the emergency,you can use the mirror to reflect a light and let your teammates know where you are. 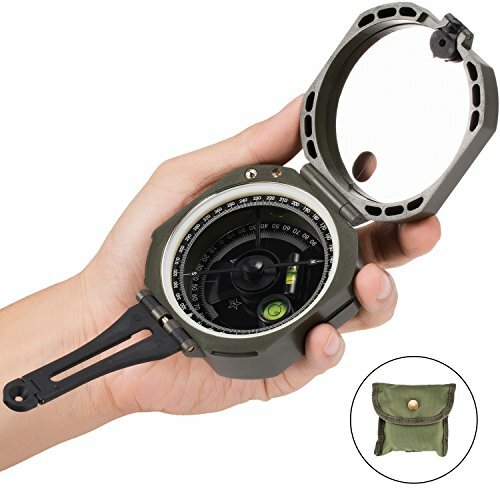 【DURABLE & LIGHTWEIGHT】The map compass is made of plastic with high quality which is waterproof and durable.The dial diameter is 65mm and the weight is only 0.2lb,that is very lightweight and suitable for carrying in outdoor.Such as:hiking,boating,adventure and so on.It also equips with small bag and you can hang on your belt.That is definitely convenient. If you have any questions about this product by occer, contact us by completing and submitting the form below. If you are looking for a specif part number, please include it with your message.